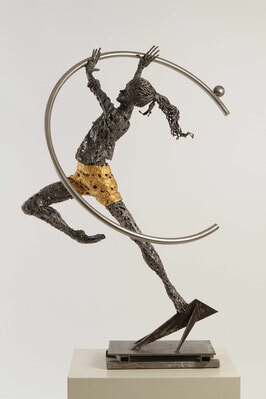 “In all my sculptures I always try to convey the feeling of motion, lightness, suppleness, three features in sharp contrast with the rigidity and the heaviness of the materials used, such as iron and steel. The motion is conveyed by the action or the shape which should be winding, never stiff. The suppleness comes from the peculiar working technique: the iron, all riddled with holes, allows you to glimpse at the backside, communicating a feeling of “passing through".